In the seventth pAsuram, AzhwAr meditates upon emperumAn having variegated aspects such as abhimAnam (pride) etc which lead to sorrow. sudar nIL mudiyAy – oh one who conducts without differentiation in your supreme state! enna suNdAyangaL – what kind of selfish acts which lead to sorrow to others? Oh one who conducts without differentiation in your supreme state and in your incarnation, in giving sorrows as per karma! You have created sorrows such as pride which are caused by being born in high family heritage etc which cause sorrow, the arrogance which is caused by such pride etc, pleasures derived from those arrogance etc, lust in the form of thirst for such pleasures which cause sorrows such as affection etc, the evolutions which cause variations in such objects, their existence and movements, and placed them; what kind of selfish acts are these which lead to sorrow to others? Mercifully explain. 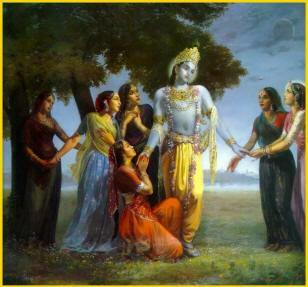 thuyarangaL … – Oh krishNa who causes sorrows! sudar nIL mudiyAy – Meditating upon his wealth is also as harmful as his divine crown. piLLAn explains this as AzhwAr reminiscing what he experienced previously in thiruvAimozhi 7.7.10 “muRRa im mU ulagum viriginRa sudar mudikkE oRRumaik koNdadhu” (my heart became attached to the radiant, divine crown [of emperumAn] which is spreading like radiance, having the complexion of shining gems and pervading the world which has three types of chEthanas and achEthanas). Because it has to be enquired and learned from him, it is said to be tormenting. thuyaram sey … – The pride of being “dhAsOham” (I am a servitor) is priceless. Unlike that, the pride which causes sorrow by thinking “sOham” (I am he [supreme lord]). madhan … – Arrogance caused by worldly joy, and the lust which leads to destruction as said in SrI bhagavath gIthA 2.62 and SrI bhagavath gIthA 2.63 “sangAth sanjAyathE kAma: … budhdhinASAth praNaSyathi” (from attachment occurs lust … due to destruction of intelligence, he himself perishes). bhagavath kAmam is unlike that [it leads to uplifting]. thulaiyAy – as pramANam (authentic text) which measures [one’s state/progress]. nilaiyAy nadaiyAy – Explains sthAvara [plants, stationary] and jangama [animals, mobile]. Also explains existence and movements [of previously explained aspects]. You are causing sorrows in this manner! ivai enna suNdAyangaLE – This is enjoyable sport for you. But this is causing sorrow for us. This entry was posted in thiruvAimozhi, thiruvAimozhi 7th centum on October 25, 2018 by Sarathy Thothathri.